Unichange.me was created to serve all people willing to make fast, secure and reliable buy, sell or exchange operations with e-currency. Our team consists of experienced players of e-currency exchange market, striving to provide high-level of work to our clients. Unichange.me staff members have more than 8 years of experience in financial sphere. Our service: - is official verified exchanger of Perfect Money - got verified exchanger account in C-Gold - got verified Paxum business account - officially verified exchanger of EgoPay - got verified business account in Fasapay Currently we are negotiating with other financial institutions and there will be introduced more exchange directions soon. Also we are planning to add Unichange cards as withdrawal method on our website. We will notify all our customers via e-mail as soon as we add this or any other option. At the moment you can buy Perfect Money, Egopay, Paxum via Wire Transfer, Western Union, MoneyGram. You can withdraw e-currency to Wire Transfer, Western Union, MoneyGram, Credit/Debit Cards. You are welcome to exchange Perfect Money to Paxum, C-Gold, Paypal etc. Check other exchange directions and fees here. Every site visitor can purchase Ukash, CashU, Facebook Cards, Amazon Cards, Xbox etc vouchers. Check full list of vouchers here. To make your stay on our website even more comfortable we provide very simple and convenient web interface. In 3 clicks of the mouse you can submit an order and just wait when it is completed. Experts of our service pay a lot of attention to every your transaction made on unichange.me. We wish to provide you with the most qualified and precise work. You can be totally sure that all your transactions made on unichange.me are very secure and accurate. To be in touch with the latest news and upgrades of our service you can: Like us on Facebook Follow us on Twitter Subscribe to our Blog Our motto is “Experience quality” and we would like you to try it out with our service! 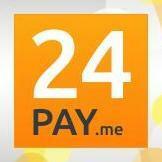 We are pleased to present the exchange service 24pay.me Service works with BitCoin, Litecoin, BTC-E, Perfect Money, eCoin.eu, OKPAY. Also we can withdraw e-currencies on PayPal, Alipay, FasaPay, MoneyPolo, China Unionpay and Visa/Mastercard cards. Via 24pay.me you can fund/withdraw e-currency accounts via Wire transfer and Money transfer (Western Union and Moneygram). All registered users can take part in our Affiliate program. You can check all our fees here. Do not hesitate to contact our support with any questions! Join and exchange with us! 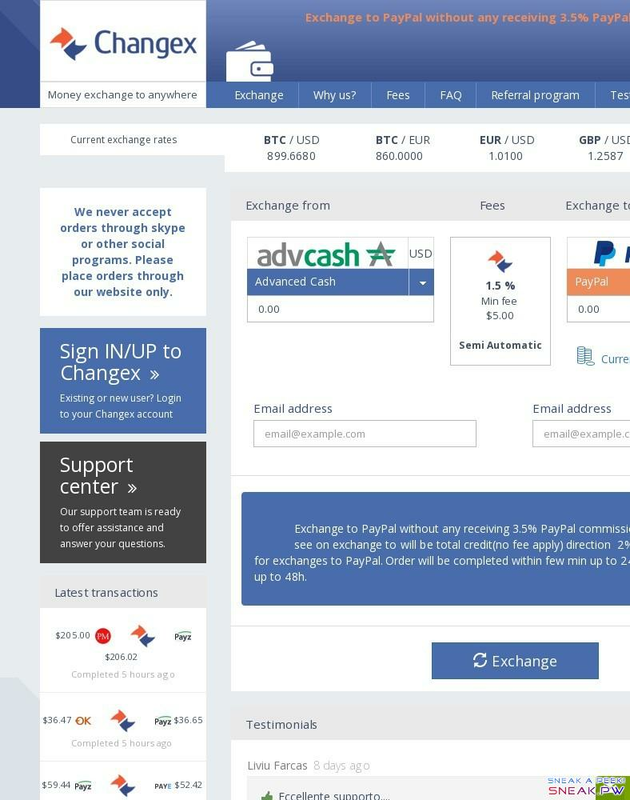 how to do payza to paypal exchange? ALFAcashier was founded in 2012 as eCurrency exchanger, today it's one of the most reliable CryptoCurrencies & eCurrencies services company. Our goal is to make CryptoCurrency & eCurrency available all over the World. ALFAcashier is your personal financier.You can also use bank transfers for the purchase and sale of electronic money, including cryptocurrency. All e-currencies exchanges are instant and it takes one minute maximum. If you do not receive your money in 10 minutes, please contact support. Please note that the speed-of-delivery also depends on payment systems. ALFAcashier provides a cumulative discount program for our customers' transaction, which means that we will give you a different discount ratio of your transaction fees according to your previously cumulative transaction amount. With your increased cumulative transaction amount, the transaction discount you get will be increased. The transaction discount is calculated on a basis of our transaction fees which will let you save more fees in your future transaction. Currently, we provide 4 account levels. The higher your account level is, the more discounts you will get when you use our service. When your cumulative transaction amount reaches the required amount, your account will be upgraded to high level automatically. And in a future transaction, you will get a discount of a new level. Changex (company - ZaRRio Holding Inc, registered in Belize) provides exclusive e-currency top-up and withdrawal services from small to large amounts. We have launched our business in 2015, and we are always looking for new ways to help our customers exchange their money from the e-wallets. Many other exchangers claim that they are legitimate and verified but in reality it is not always the case. We are proud to say that many e-currencies including Perfect Money, OKPay, Payeer and C-Gold have recognized us as a legitimate, trustworthy and professional exchanger. What differentiate us from the rest: We are the fastest. Many exchangers use the same system to exchange their clients’ money. We have built our own system from scratch. We have developed relations with e-currency providers to enable a cutting edge speed of exchange. Today, we offer the lowest exchange rates. Our agents work hard every day to guarantee that our customers get only the best deals to exchange their money. We believe that it is unfair for exchangers to charge high fees for the exchange services while the service costs are relatively low.